In many classrooms, as the leaves are turning, teachers feel as if they are turning a corner. The Fall rituals and routines have been introduced and the management is firmly in place. Now our focus can really shift to the curriculum, the fun part of teaching and learning. As a new month approaches, teachers are ending some units of study, while preparing to begin others. This leads to wondering how do we insure the children hold onto what was taught and also introduce them to what’s coming up. If you’re one of our regular subscribers you probably know what we are going to say. Yes indeed – turn to charts to help do this work. This week we will focus on creating charts that use examples to review, reinforce, and highlight previous teaching and learning, as well as those that introduce new genres. 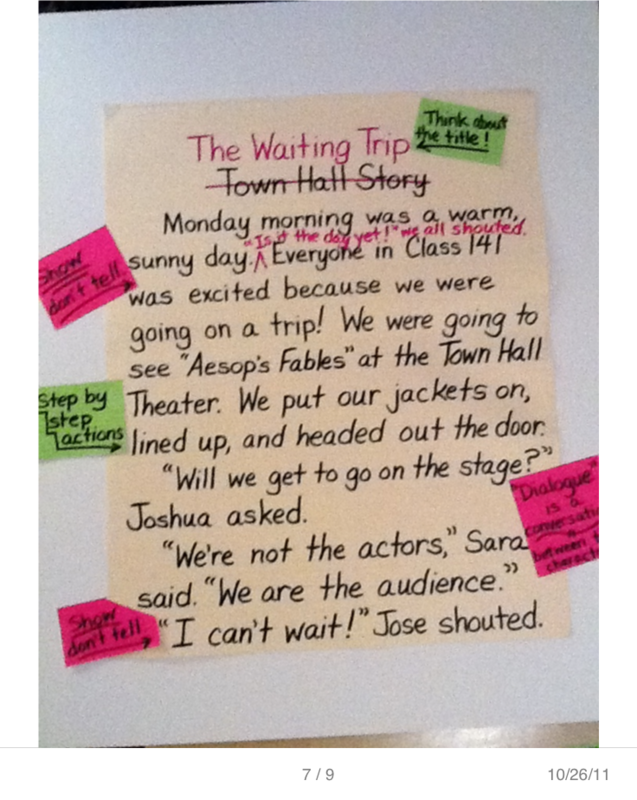 In a previous post we talked about the value of putting up exemplars in the classroom to provide models children can strive towards and mentor themselves to while working in a reading or writing workshop. Show don’t tell is the key to writing and it is also the key to memorable teaching. 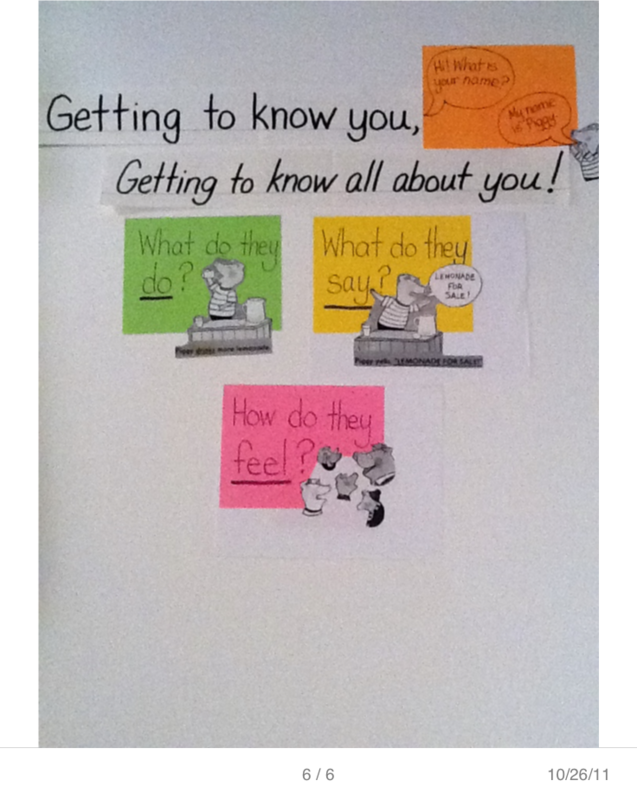 The first chart below started as a shared writing piece co-created with the children in a First and Second grade bridge class, after a very long field trip the class had experienced, during a narrative writing unit. The story then became a piece where the children practiced various strategies taught during several lessons. As the teacher prepared to bring the unit to a close, she decided to use this practice piece of shared writing as a way to reflect on all the class had tried and learned during this writing unit of study. The teacher annotated the text by writing explanations on post-its as the children shared out what they had done to craft this story, and then putting these up around key examples of craft, revision, and editing found in the text. An example of how shared writing can be turned into a chart by annotating key parts of the text . For example, the revised title is highlighted to show how changing a title can change the meaning or tone of a story. The title is underlined and the post-it, with the explanation, has an arrow pointing to the title, drawing the eye back towards the title. Other craft moves annotated around the chart include examples of “show don’t tell,” step by step actions, conversational dialogue, using a repeating line, and using more specific vocabably, with arrows pointing to the place in the text these revisions can be found. The second page also highlights some editing moves the teacher wants children to contiue to use, like using a carrot to insert missing words, phrases or sentences. Other things could have been highlighted, but it is always wise to limit the number of points on any chart to no more than five key bullets. In this case they are not literally bullets, but post-its on which the key points are written. Using a shared reading text also provides a context for when and where these revision and editing strategies can be used. This is the second page of the class' shared story which highlights further revisions and edits. 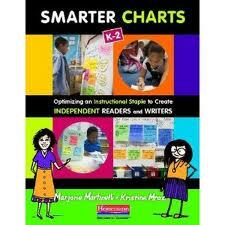 The next chart is a genre chart put up at the start of a reading unit on character. In this class the teacher had started the year off with the song, “Getting to Know You” from The King and I, as an invitation to everyone in the new community to get to know all about each other. When she was thinking about how to introduce the character unit to her first graders the song, “Getting to Know You” immediately popped into her head. So she pulled out the song and wrote the first two lines on the chart as her heading in preparation for her lesson. When the time came for the lesson to begin, all she did was hang up the chart with nothing but the song heading on it and the children immediately started singing. This lead to the connection that just like the children got to know each other at the beginning of the year, they were now going to be getting to know lots of different characters found in books, getting to know all about them. The heading comes from a familiar song and the examples come from a favorite book. Charts that use examples usually need to be prepared ahead of time. In this case the teacher chose one of her class’s favorite characters, Piggy, from the Piggy and Dad series (BrandNew Readers, Candlewick Press) and found excerpts that illustrated the strategies she wanted to teach. These were then photocopied, cut out, and taped to the 6″ x 8″ post-its on which she had written each strategy for getting to know a character, plus one to illustrate the heading. Then as she taught each strategy she put up the example on the chart. This move physically emphasizes each point being made. And it always grabs the children’s attention. And the use of a well-loved character engages all the children, which ultimately is what makes a lesson memorable. So if you want to insure the children in your classroom hold onto what was taught, and also introduce them to what’s coming up, you might try teaching by example. Let us know what some of the ideas are you try and, as always, happy charting! I just like the helpful ihfo you supply to your articles. regularly. I am rather sure I’ll be told many new stuff right here! I could not refrain from commenting. Verry well written!